Planning on hiking the PCT, CDT or AT? Then you can’t get around not reading German Tourist’s book “Laufen. Essen. Schlafen.”. I met Christine two years ago as she was cycling through Finland, and we spent a nice afternoon eating cake and sushi in Vaasa. Of course I knew her much longer digitally, but it was really nice to finally met her and hear more about her stories from hiking, paddling and cycling around the globe. 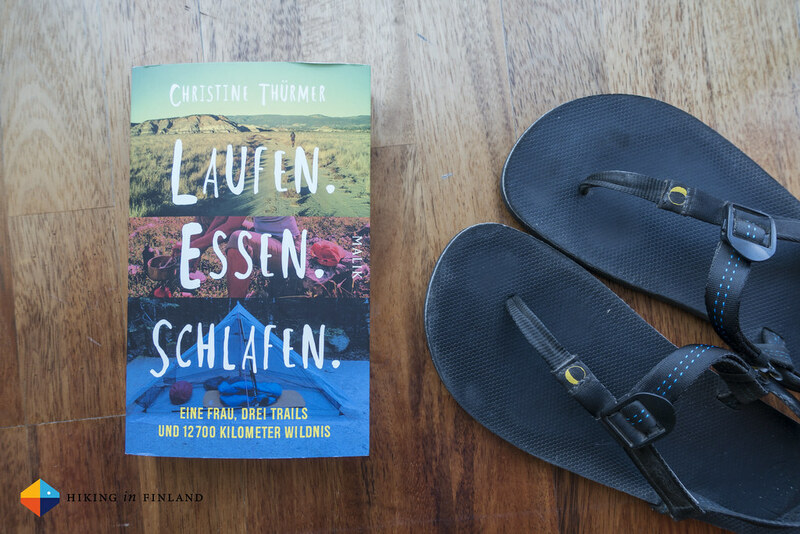 If you’re not so lucky to meet German Tourist (her Trailname) then you should pick up a copy of her book Laufen. Essen. Schlafen. which was published just a month ago. It’s in German, though, so I hope your Deutsch skills are up to scratch. The book chronicles GT’s decision from first hiking one long-distance trail in the US to all three and abandoning a normal 9-to-5 life. The book starts out with Christine as a successful business women who is on holiday in the US, to losing her job and a good friend which in turn make her decide to go hiking the Pacific Crest Trail. The hiking story reminded me in parts of Keith’s The Last Englishman, a book about Keith’s PCT hike. It’s a mix of trail description, trail talk (gossip) and Chrisitine’s experiences on the PCT. The PCT chapter is also the longest of the 288 page long book, with each subsequent chapter getting shorter. The CDT chapter then starts again with Christine the successful business woman, a romance that’s doomed from the start, and the hard hiking life on the CDT. No rest days for three and a half months! During the CDT chapter German Tourist meets friends from the PCT again, loses her job while hiking the CDT and subsequently decides to quite the 9-to-5 rat race life. The AT chapter, which is a mere fifty something pages, then feels hurried. There’s the misery at the start, the realization that she does not need to hurry anymore, more meetings with old friends from the PCT and pretty autumn hiking through the green jungle. I read the book in a day and overall found it an enjoyable read. There were a few sections that made me thoughtful, sad, laugh and anticipate what would happen next. The book is entertaining, but I felt that in the CDT and AT chapter Christine was just in a hurry to finish the book and get outdoors again - I would have wished for similar insights & details from her about these two trails, too. Despite this I think it is a great read for anyone who is interested in hiking and long-distance backpacking, as Christine writes eloquently about the life on the trail and what it entails. The sections about her conversations with fellow thru-hikers and trail angels where my favourites by far, and made me want to pack my backpack and fly over to the USA! Get your copy from Piper, Amazon.co.uk or Amazon.de.